The content of this article provides interesting history, facts and information about Roman Hats. Romans are not commonly associated with hats but there were occasions when the were worn, generally for protective purposes or on special occasions. The requirement for hats was lessened by the number of hooded cloaks which were available to Romans, these hooded cloaks were called cucullus. For facts and info about military hats refer to Roman Helmets. The Roman men generally went with their heads bare except at sacred rites, games, festivals, journeys or in war when helmets were worn. At games and festivals a woollen cap or bonnet was worn. Hats were also worn for a practical purpose as protection against rain, the cold and occasionally too much sun. The Roman hats worn by men were generally styled with a brim to provide protection form the elements. Leather was used which was made rainproof by the application of grease. Felt was also a popular material for hats. Felt was one of the cheapest materials to produce by matting, condensing and pressing fibers. For outdoor activities at home a straw hat might be used for gardening. On certain state and religious ceremonies the toga was pulled over the head. The Pileus was the name of the the most common hat and was often worn by those who had just been granted freedom. The Petasus was the name of the wide brimmed hat which was used when travelling. It was similar to the Pileus but had wider rims. The type of hat called a Mitra and many other types of hat were imported customs from abroad. The mitra was a headdress resembling a turban but only really worn by foreigners as Romans considered it effeminate dress for a man. A variety of hats were worn during religious ceremonies by Roman priests. 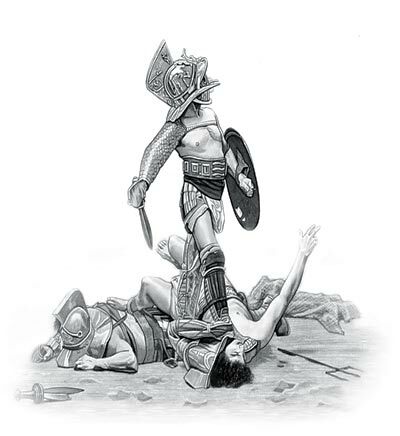 The most common hat was the galerus which was similar to the Roman military helmets called Galea. The galerus was a pointed hat made of the hide of a sacrificial animal and were occasionally decorated with twigs of sacred trees, such as the olive tree. Priests of a high rank had a spike (apex) attached to the top of their galerus whereas lower ranking priests had a knob on their hats. Vestal Virgins wore a Suffibulum which was a veil which was worn especially while sacrificing. The Suffibulum veilwas short and white with a purple border. Just like the men, roman hats were not often worn by women. They also wore hooded cloaks for protection against the weather. As the clothing fashions of women hardly changed they took great care in creating the most elaborate hairstyles. These intricate Roman hairstyles would be ruined by wearing hats. It therefore became common for women to wear veils rather than hats. Headdresses were also popular and complemented the hairstyles. The name for a woman's headdress was called the calautica. Another common type of veil used for special occasions was the Flammeum. The Flammeum was the wedding veil which was a deep yellow, like the flame of a candle. For more info refer to Roman Wedding Clothing. The content of this Roman Hats category on Roman clothes worn by the people of Ancient Rome provides free educational details, facts and information for reference and research for schools, colleges and homework. Refer to the Colosseum Sitemap for a comprehensive search on interesting different categories containing the history, facts and information about life and clothes worn in Ancient Rome.